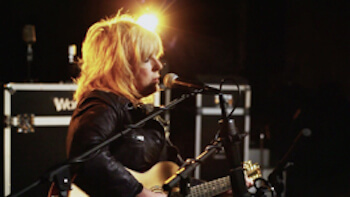 Since her 1998 Grammy award winning Car Wheels On A Gravel Road, Lucinda Williams subsequent albums have been eagerly anticipated by fans and critics alike. The depth and candidness of her songwriting is as honest and unique as her vocals and guitar picking. She straddles, Rock and country music and all the hipster sub genres in between. Drawing from her Southern Gothic background and her literary upbringing (her dad was poet Miller Williams), Lucinda's new album Ghosts of Highway 20 is rapidly gathering the best reviews of her career. In her performance here, she's as stripped back and vulnerable as her songs. Check out her "21 Questions" interview with Nic as well, as she calls out a couple of sexist male stars she's met along the road. (BTW: Lucinda had a cupboard door bump into her face a few days before we got together. Nonetheless she showed up and delivered on all fronts).